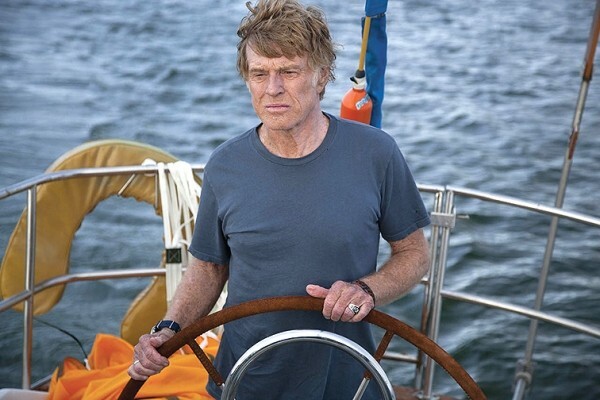 We never learn the name of the grizzled yachtsman (Robert Redford) whose eight-day fight to survive on the open sea is chronicled in J.C. Chandor’s magnificently primal All Is Lost. At the outset, in a prologue set before we flash back eight days, we hear the contents of a resigned letter written to family members, referring obliquely to the regrettable faults and mistakes of his life. But we never know anything more about the nature of those mistakes, or his relationships with his family, or anything beyond the day-to-day, moment-to-moment needs of finding a way to keep his head above water. For all practical purposes, Redford is playing Man—the human animal, a flawed but ferociously determined creature whose primary evolutionary advantage in the face of disaster is the ability to think, and improvise, and figure out a Plan D when Plans A, B and C have already failed. There’s no ironically fitting accident that sets Redford’s character on his life-threatening course. He’s merely sleeping in his drifting 39-foot boat, more than a thousand miles from land in the middle of the Indian Ocean, when it collides with a derelict shipping container, tearing a hole in the hull. By the time he awakens and gets to work sealing up the breach, salt water has damaged his engine’s batteries and his radio equipment. And by the time he’s ready to sail to safety, an oncoming storm threatens even more catastrophe. Chandor underplays the drama of the situation throughout, confident enough in the inherent intensity of the hero’s plight that he can reserve use of Alex Ebert’s score for select moments. While superficially it might feel like a film composed largely of mundane physical tasks—Redford’s character manually pumps the water out of the boat, gathers supplies, climbs the mast to work on his radio antenna—every action is loaded with life-or-death significance that requires no external emphasis. All Is Lost maintains its intensity simply through following one man who understands that methodical action is his only hope. If “methodical action” sounds far from thrilling, perhaps it’s hard to convey what Redford brings to this role. He’s never been the most versatile actor, but his nearly wordless performance here is almost perfect, and not just because his sun-weathered look makes him an ideal fit for a character who needs to seem as though he’s been at sea his entire life. Without dialogue to let us into his head, Redford has to convey a combination of experience and intelligent resourcefulness; every brainstorm or necessary deviation emerges through a shift of the eyes, or a tightening of the jaw. For all the physical turmoil of this man dealing with a capsized craft in a fierce storm, the most gripping moments come from watching Redford figure out how to make it through one more day with the few physical tools he’s got left. Near the end of All Is Lost, the story eventually reaches the chronological point from which Redford’s character narrated that farewell letter from the film’s prologue. We watch him, at a moment when he’s feeling the emotions that gives the film its title, scratch away those likely final words—but we don’t hear them again. Chandor is confident enough, and trusts his audience enough, to know that we’ll understand what we’re seeing. As much as All Is Lost is about survival, it is also, brilliantly, about presence—the need to strip away everything extraneous so that you can get from this moment to the next. Like he does with his protagonist, Chandor hands us nothing, forcing us to focus similarly on the events unfolding and demanding attention right now.